Laura Morrison driving Charlie across Africa. 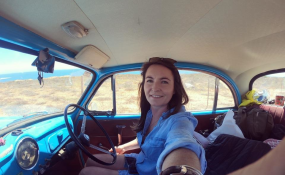 Laura Morrison, 36, kept a journal of her journey on social media as she drove "Charlie" - a 1958 Morris Minor she inherited from her dad Neil when he passed away from cancer in 2016 - across 16 countries. "This was my dad's dream to drive from his birthplace to Cape Town. He moved to the continent in his late twenties and had a great love for Africa." "But each country had something amazing about it as well... "